Your formal dining room may be a space that isn’t used too often, but when it is, you want the ambiance to be just right. With the proper dining room lighting, you can accentuate your table, your china cabinet, and any artwork you have in the space. 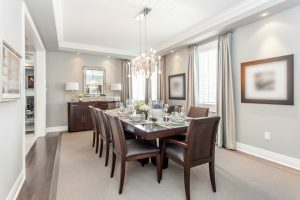 At Hortons Home Lighting in La Grange, our experts can help you choose new dining room fixtures that will provide plenty of light and dramatic effect. A dining room’s focal point is obviously the table, and the size and design of the table can determine the type and style of lighting the room needs. You want to be sure there is plenty of light for the entire table, so no one is sitting in the shadows as they eat. A chandelier can be a great choice, but it’s important to know what size of chandelier you need, and if the ceiling can accommodate the fixture. Your dining room may also hold your china cabinet, and it’s important to accentuate your plates and cups with proper lighting. LED lighting strips and undercabinet lighting can highlight your fine china, as well as any curios or decor on display. When it comes to artwork, track lighting or a single spotlight can draw attention to the piece. Lighting controls are also important for the dining room, since you may want to set the mood with low light for that special occasion dinner. Hortons has a complete inventory of fixtures, controls, and bulbs, and our team will gladly help you find the ideal options.